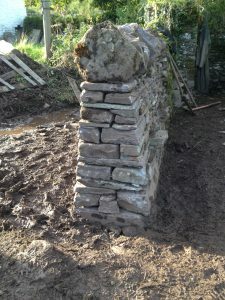 Dry stone walls are an ancient form of boundary, important in terms of landscape and conservation, as well as providing stock proofing. North Wales, with its wide variety of rock types, has numerous different styles of wall, all built with essentially the same principles adapted to suit the local stone and needs. Walls are not necessarily uniform stone barriers; many include interesting features such as sheep holes, drains and stiles. Local styles also greatly affect the character of walls, many walls built out of large slabs often have small gaps in their faces to save on stone and in some areas quartz has been placed in the “coping” (top stone) to ward off evil spirits. Frequently walls are over 100 years old, often built at the time of the enclosure movement to provide field boundaries and to clear stone the fields and are steeped in local history and folklore. In areas where stone was more scarce “clawdd” walls can be found, these stone faced earth banks, are normally lower than a wall but usually have a hedge planted on top and sometimes have a ditch on one side. Wales is one of the few strongholds of these “stone hedges” with variations commonly found in Devon and Cornwall, and occasionally elsewhere. Unfortunately the majority of walls and clawdds are falling into a state of disrepair. Originally they would have been maintained on an annual basis. With changes in farming practices – most notably labour levels – this practice has changed and walls are often neglected to the point where expensive major repair work is required. Many thousands of hours of work went into the building of Wales’ network of walls, mostly in a surprisingly short period of time. Their expected life-span is largely indeterminate, depending on a wide variety of factors, such as ground conditions, stone type, construction techniques, how exposed the site is and so forth. Unfortunately they do not last forever and following years of neglect they are now falling into a state of disrepair at a faster rate than they can be repaired. Repair is undoubtedly expensive, but many grants exist to ease this cost, and they will outlast a fence many times over if properly maintained, and in the long term can prove to be a wise investment.